People across the world took part in a unique protest against the Spanish law that limits the rights of the public to rally. 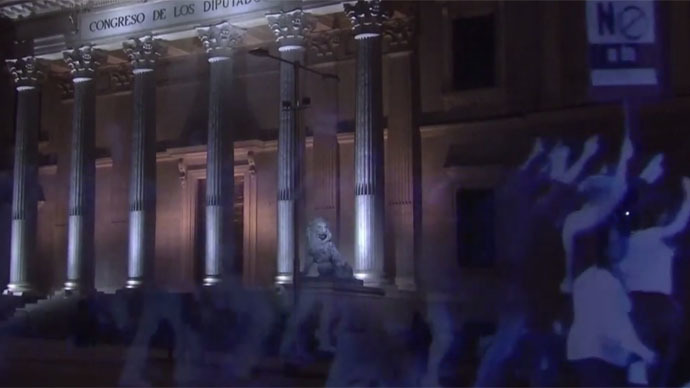 No one attended the virtual march, but holograms of protesters were projected outside parliament in Madrid instead. Activists have recently launched a petition against the Citizen Safety Law, which has been called the “gag law” by opposition groups and the media, saying it "restricts citizens’ liberties, and criminalizes their right to protest." "To respond to this injustice" activists behind the “Hologramas para la Libertad” movement said they "saw the need to carry out a different kind of protest that would allow our demands to become unstoppable: the first hologram protest in history." The draconian law, which was passed in the lower house of parliament in December, gives sweeping powers to the authorities. It makes it illegal to protest outside government buildings, insult police officers or refuse to show identification documents. On top of that, there's also a €600 fine for showing a lack of respect to anyone in uniform, while the photographing or filming of police officers, where they could be put in danger, will incur a €30,000 fine. From now on the government can basically prohibit any protest if it fears order would be disrupted. People have to seek permission from the authorities to protest publicly. Any unauthorized protests outside buildings that provide basic services to the community will incur a fine of up to €600,000 ($746,000). This covers a huge number of buildings, from universities to hospitals. The measure has been slammed by the international community in recent months since it breaks international and EU laws.